The labor movement in the United States has been in a crisis for several decades. The most organized sector of that movement, the trade unions, have faced shrinking numbers, density, and an offensive from both employers and government. Technological changes in the workforce have tended to transform and eliminate unionized jobs, while the dominant, individualistic culture typically found within the U.S. has been strengthened over the last 30 years. None of this is news to anyone likely to pick up and read this pamphlet. 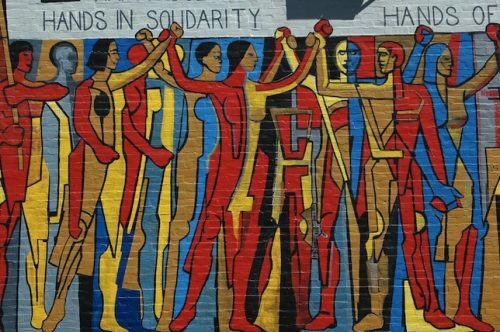 We argue that the prolonged crisis of the movement is rooted in our past: the political weaknesses of Gomperism has hemmed us in for most of the entire history of the trade union movement in the United States. More common, but less precise terms for this conservative brand of unionism might be “business unionism” or “bread and butter unionism”. We assert that if we understand this history, the contending social justice counter-currents of our past from which we can learn, and changes in the U.S. workforce today, we have the opportunity to turn things around. Social justice unionism in the U.S. today calls for a particular politics: a recognition that trade unions are just one part of a broader working class movement that can be united to advance new forms of organizing to build regional working class power. Key to this is an ideological re-founding of the broader labor movement on social justice principles, especially the fight against white supremacy. Download the full pamphlet here.